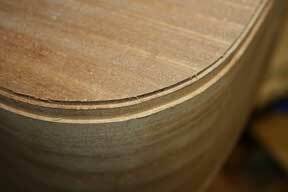 This is How to Make an Acoustic Guitar – Part 15 – Binding Ledges. 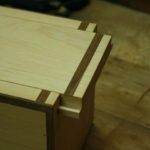 In this part of the series I will show you how to create the ledges or rabbets for the binding and purfling strips. Enjoy. Adding binding to the guitar body serves a couple of unique purposes. The first is that it trims the body nicely, and creates visual appeal. The second is that it covers up the joint between the plates, and seals the end grain as well. First and foremost, many guitar makers use their binding design as a visual addition that makes the guitar look better. It’s important to have a good looking instrument in the end, and binding can help you make your guitar look awesome. 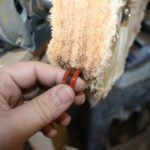 The slightly more hidden reason for binding strips is that they help prevent moisture loss through the end grain of the plates by covering them and sealing them. This also hides the joint between the top and the sides, which is another good thing. There are a lot of different approaches to binding a guitar, and a lot of interesting looking machines to accomplish the job. Don’t let that overwhelm you. Creating binding ledges is actually pretty straightforward, you just have to take your time. Just like applying a world class finish, your binding ledges are only going to be as good as the surface you create them upon. If your corners are poorly shaped, and not sanded flush all the way around, your ledges will reflect that. Before you even think about creating a single channel, go back over your guitar again and make sure that all of the corners around the top and the back meet really well with the sides. If there are any that need help, address them now. You are looking for a squareness, and no presence of lumps or oddities that would alter the path of the binding strip from anything other than traveling right along the edge of the guitar. If anything needs attention, the more you do now the better your binding will look. What is a Rabbet and What Does it Do? 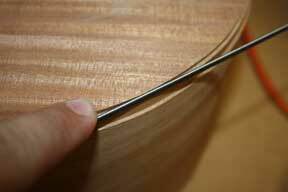 A rabbet, or binding ledge is simply a notch taken out of the edge of a piece of material, running the entire length. You can think of it as an L-shaped cut out that leaves a tiny little shelf or ledge around the sides of the guitar, near the plates. This creates a tiny shelf where a binding strip can rest. 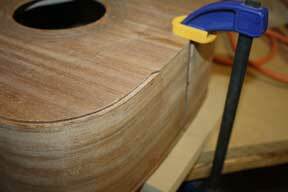 Once you apply some glue behind that binding strip, and secure it in place, it follows the profile of the guitar all the way around the top and back plates. These ledges can be as simple as a single rabbit for one strip, or it can be two different rabbits for multiple strips. Binding is an opportunity to show off a little bit of woodworking prowess, and many guitar makers take advantage. Binding is one of those areas where things can get out of hand pretty rapidly. You want to create a beautiful design, but a lot of times you forget that there is beauty in simplicity. There is also an easier path with simplicity. If this is your first binding scheme, go with a single binding strip by itself, or one binding strip with one purfling strip. It’s going to be very difficult to wrestle 10 different strips into place on your guitar, especially on the first round. Don’t make it worse than it needs to be. Instead of setting yourself up for a lot of exhaustion and stress, pick a simple but elegant binding design that you know you can accomplish well. It’s better to have a simple design installed perfectly than an elaborate design installed poorly. For the sake of transparency, and being completely honest, I have never ever once created my binding ledges by hand. I own a router, and I know how to use it. It’s a quick process, and it’s the way that I’ve always done it. Though it can be done by hand, it is going to be a much longer journey. There are different hand cutters and markers that you can buy that will help the process, but in the end it’s going to be you and your chisel for hours and hours. If you don’t have the tools to do the rabbit ledges by hand, then I recommend you just buy a router and bits because it’s not going to be that much more money. 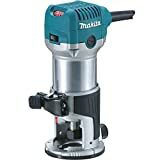 Especially if you buy nicer hand tools, the cost can be very similar. 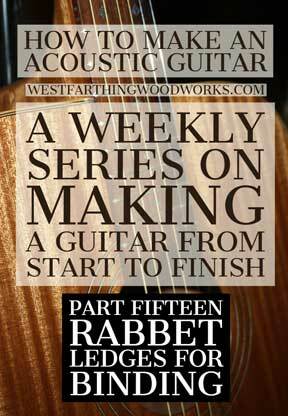 The basic process involves scoring the edges of the guitar all the way around to outline where the rabbits need to be. After that, you come back and take out that material with different hand tools. It’s a long process, but if you want to make a guitar without power, it’s what you’ll need to do. By far the easiest way to create a ledge on an acoustic guitar is to use a router and a rabbit bit set. 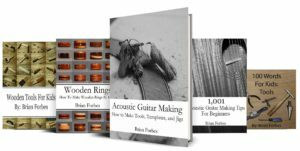 There are specialty sets that you can buy from acoustic guitar making suppliers, and these do work a little bit better than a standard set from a hardware store. 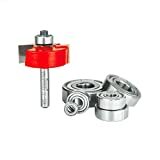 The only reason I say they work a little bit better is that the bearings are sized to create ledges that are just about exactly the same size as common binding and purfling thicknesses. This does make the process a little bit easier, but it’s not 100% necessary. I’ve been making my binding ledges using a standard rabbit bit set that I bought ages ago. I have to do a pinch more sanding sometimes, but what I’ve been doing lately is just making my binding strips a pinch thicker than normal. Also, you can add filler strips if you need to or simply scrape the purfling just a little bit before you install the binding and you’ll have a perfect fit. It does require a bit more haggling in the beginning, but it does work well. 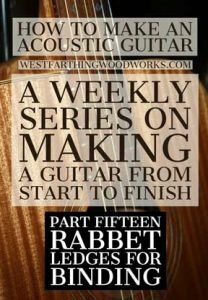 If you do anything that I ask in this entire post, it’s that you get a scrap of wood and test out your binding ledges before you actually commit to the guitar. This doesn’t have to be anything special, and a 1 foot long piece of Pine with square edges is perfect. All you do with this piece is test your rabbits to make sure that the binding strip fits inside it well. 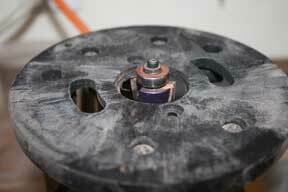 Make sure that there is at least a tiny tiny fraction extending above and outside the ledge to sand flush later, but it can be as minimal as the thickness of a piece of paper. The biggest thing to avoid is inlaying the binding strip or purfling strips too deep. At that point, you’ll have to remove material from the top or the sides to make it flush, and it just looks bad. This is where your test scrap is very helpful. Once you have your sizes figured out, it’s much easier to proceed confidently to the actual guitar itself. 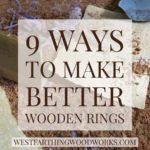 You won’t have to worry about doing anything destructive, and you’ll know that your binding and purfling strips will fit really well. Remember, you need to do these one at a time. Once your router is set up perfectly, you don’t want to mess with that. Instead, create the first ledge, and then go back to your test block to align the second before you do it on the guitar. On the back plate, near the head block by the shoulders, the angle of the back plate makes routing a little bit more difficult. Even so, there is typically enough room to make the ledges at least deep enough to start with. Since the back plate is angled, it does make your cut a little bit more shallow than it normally would be. This is OK though, because all you need to do is come back with a scraper or a sanding block and finish it. 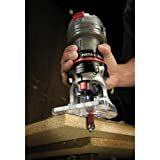 The other thing you can do is cut down your router plate to be a lot smaller, and typically that will help you get into those tight places. However you do it is up to you, but you will need to deepen that rabbit so the binding strip doesn’t get too thin. 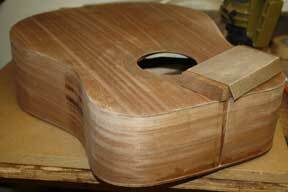 After you’ve created your ledges, get your binding and purfling strips and test fit them on a straight section of the guitar. Make sure that they align well, and that there haven’t been any alterations in the depth of cut. 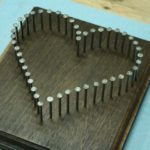 This is an important fitting stage, and it’s definitely worth checking this out before you add glue to the situation. If there are any issues at this point, you do have a number of different ways you can work yourself out of the problem. If your rabbits aren’t deep enough, simply adjust your settings, do another test run, and then deepen them on the guitar. This is the easier problem to have, so just go back and deepen the rabbits with another pass. If your ledges are too deep, it creates a bit more of an issue. However, if you’re not off by much you can always mill your own binding strips a little thicker than normal. You could also add another purfling strip, even a very thin one to fill any gaps. Now that the binding ledges are already on the guitar, it’s time to create some binding strips that we will glue into those ledges. You can always buy binding strips if you want to, but making them is a huge money saver. 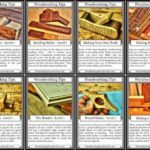 Odds are that you probably already have the tools you need to make the strips, so it’s well worth taking a look at this process to see if it’s something you like. 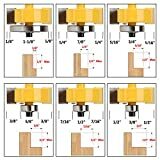 After all, binding strips can be 3 to 5 dollars a piece, and making them yourself costs pennies. I’ve been making my own binding strips for years for that simple reason. It also allows me to choose the exact species that I like without paying a premium. Most of the time I have the wood in the shop already, so it’s a matter of grabbing a piece and cutting the strips. 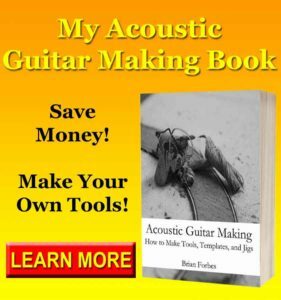 If you have any questions on how to make an acoustic guitar, please leave a comment and I’ll be glad to answer them. Happy building.